Winter is here and so is a whole new world of options for looking great! Get your Winter fashion game on with one single master stroke – layers! Nothing says Winter like layers that swathe you in stylish statements. Layer yourself in winter weaves to bring out an eclectic yet chic and refined statement. If you thought adding layers is all about looking bulked up in pieces that do nothing for your frame and figure, then this is a must read for you! Palazzos, a Dress and a Coat: Who would have thought, right? But the folks at Georgeautiful have shown how to layer with these three basics – and we are loving it! Blazers: Keep warm yet stylish with a woolen blazer. My favorite look is the classic blazer thrown over a bodycon mini dress or skirt and vest separates. Who says you cannot layer Summer and Winter clothing? Just round up the look with a scarf and a pair of ankle skimming booties. Try neutral yet feminine hues like blush and muted teal for a cool effect. While you are at, look at the cuts and detailing like ruffles and buttons to choose truly unique pieces. the classic denim jacket, high collars and oversized cuffs would also look great. Scarves: Wear a solid hued polo neck and tie a scarf like a waistcoat or vest for a chic effect. Pile on the chunky necklaces and a few bangles or simple hoop earrings for a look that says – watch out Bohemian chic! Also, this look will keep Summer in your closet with a layer of fun. 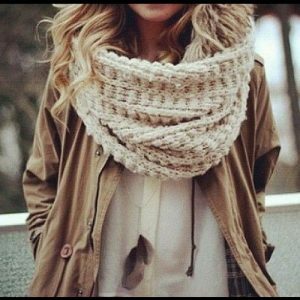 Keep those chunky scarves handy for an anytime, anywhere hint of glam! Athleisure it: Take a long vest with a lace neck, add a cropped cardigan and pair with jeggings lined with oversized track stripes on the sides. Crop the look with knee high boots and get a look that can fit in a walk, or a stroll down the grocery aisle – relaxed, comfortable and layers in place! Think sheer panels across track lowers for this look too. Warm Lowers: Get those fleece lined leggings and jeggings into your wardrobe for a seamless look where you play with layers. Add a mini skirt in Scottish checks or keep a lace long vest on top and printed leggings below. Throw on a military style coat on top and a pashmina shawl slung on the side for layer upon layer of style! Dresses: Do not send your dresses to the back of the closet just because Summer is over. Keep those dresses around to pair with contrast hued long coats and quirky stockings. Get a pair of vintage boots with a pretty white lace dress and a princess cut coat for a graceful layer. Don’t forget those pretty earrings and a chic backpack to complete the edgy yet feminine look. Even a simple jersey dress or a safari dress can get the Winter layers with these touches. Bomber Jacket: This new Fall to Winter to Spring staple is here to stay! Keep an olive green or floral bomber jacket around to layer in style. Goes well with leggings, vests, dresses, skirts and more!